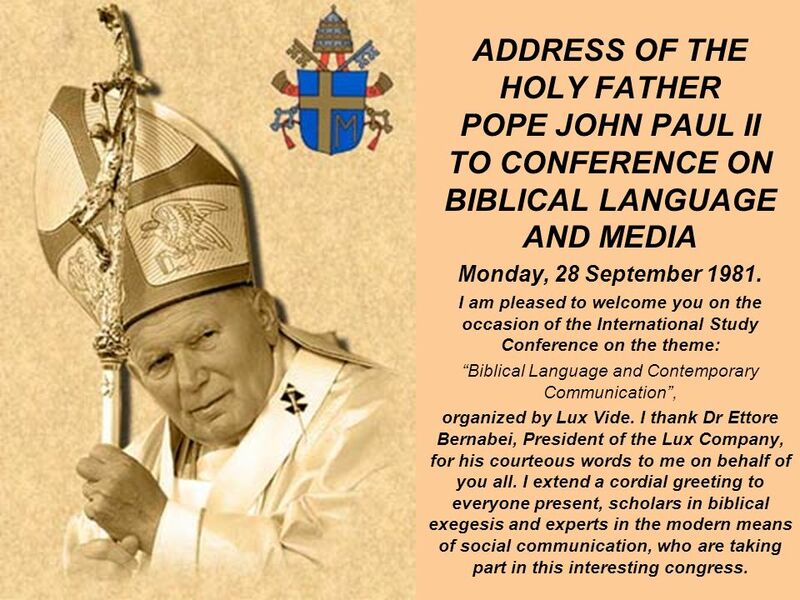 ADDRESS OF THE HOLY FATHER POPE JOHN PAUL II TO CONFERENCE ON BIBLICAL LANGUAGE AND MEDIA Monday, 28 September 1981. I am pleased to welcome you on the. 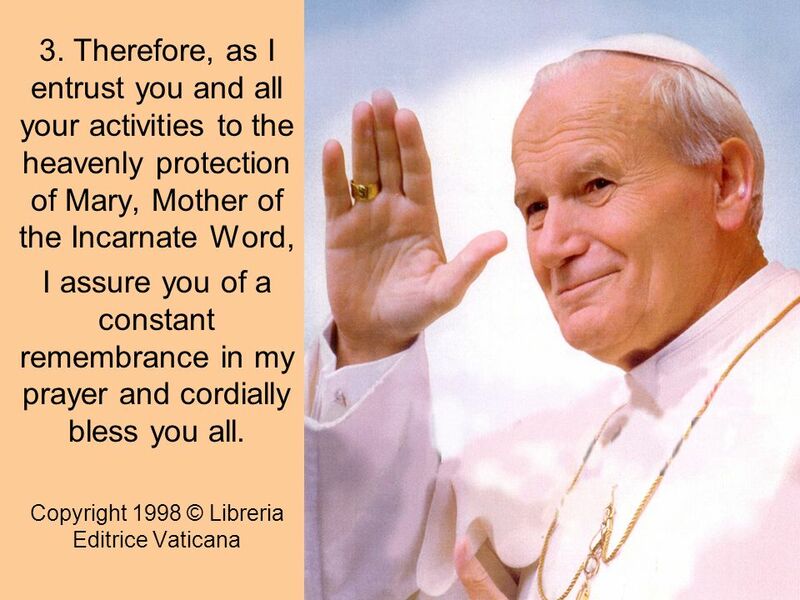 1 ADDRESS OF THE HOLY FATHER POPE JOHN PAUL II TO CONFERENCE ON BIBLICAL LANGUAGE AND MEDIA Monday, 28 September 1981. I am pleased to welcome you on the occasion of the International Study Conference on the theme: Biblical Language and Contemporary Communication, organized by Lux Vide. I thank Dr Ettore Bernabei, President of the Lux Company, for his courteous words to me on behalf of you all. I extend a cordial greeting to everyone present, scholars in biblical exegesis and experts in the modern means of social communication, who are taking part in this interesting congress. 2 1. 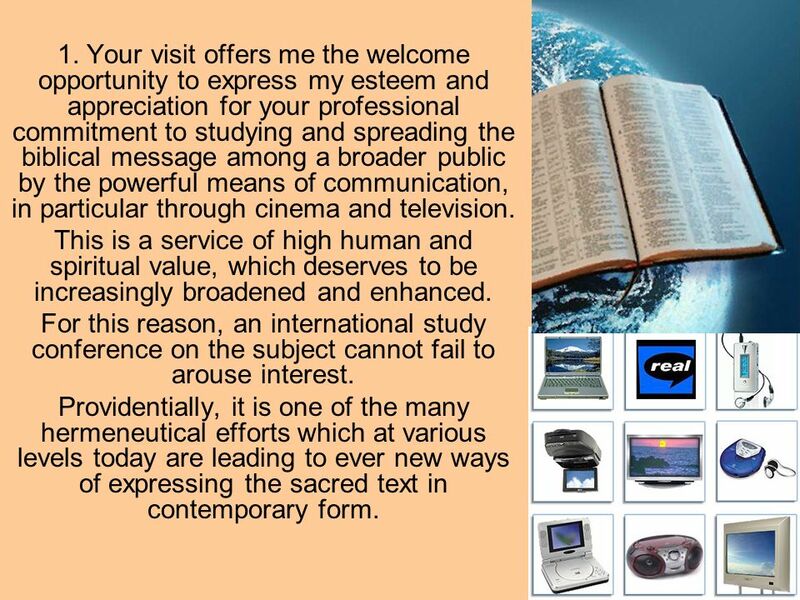 Your visit offers me the welcome opportunity to express my esteem and appreciation for your professional commitment to studying and spreading the biblical message among a broader public by the powerful means of communication, in particular through cinema and television. This is a service of high human and spiritual value, which deserves to be increasingly broadened and enhanced. For this reason, an international study conference on the subject cannot fail to arouse interest. Providentially, it is one of the many hermeneutical efforts which at various levels today are leading to ever new ways of expressing the sacred text in contemporary form. 3 2. 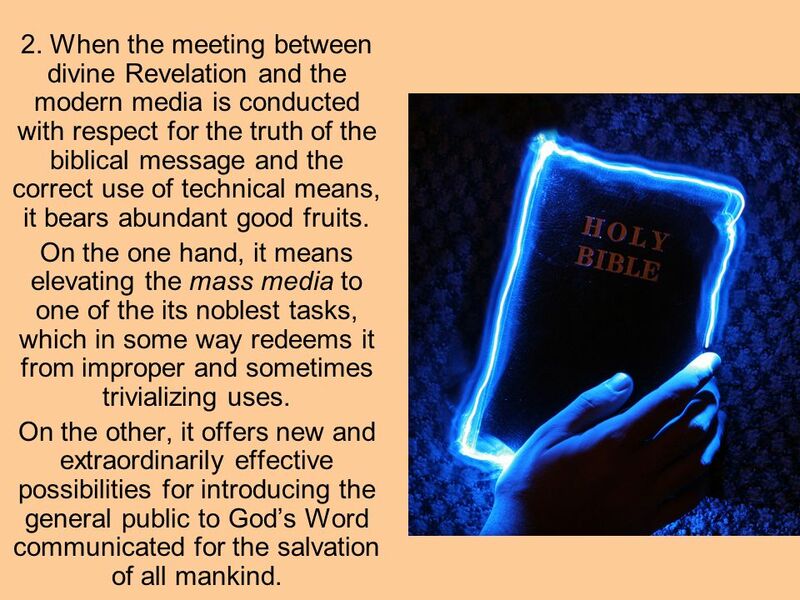 When the meeting between divine Revelation and the modern media is conducted with respect for the truth of the biblical message and the correct use of technical means, it bears abundant good fruits. On the one hand, it means elevating the mass media to one of the its noblest tasks, which in some way redeems it from improper and sometimes trivializing uses. On the other, it offers new and extraordinarily effective possibilities for introducing the general public to Gods Word communicated for the salvation of all mankind. 4 2. 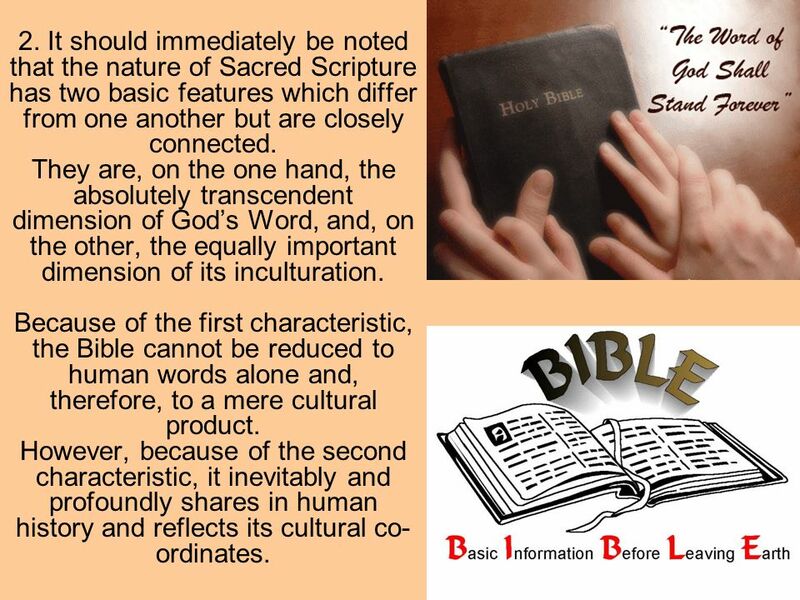 It should immediately be noted that the nature of Sacred Scripture has two basic features which differ from one another but are closely connected. They are, on the one hand, the absolutely transcendent dimension of Gods Word, and, on the other, the equally important dimension of its inculturation. Because of the first characteristic, the Bible cannot be reduced to human words alone and, therefore, to a mere cultural product. However, because of the second characteristic, it inevitably and profoundly shares in human history and reflects its cultural co- ordinates. 5 2. 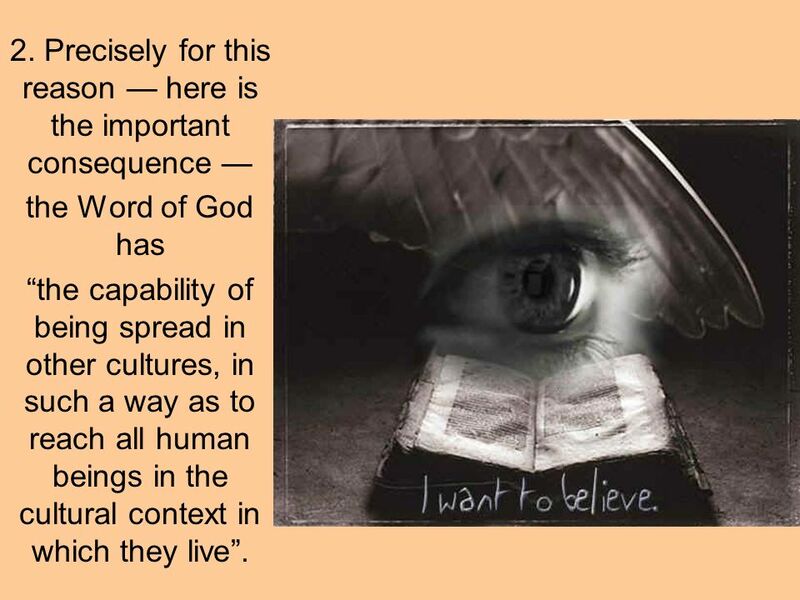 Precisely for this reason here is the important consequence the Word of God has the capability of being spread in other cultures, in such a way as to reach all human beings in the cultural context in which they live. 6 2. 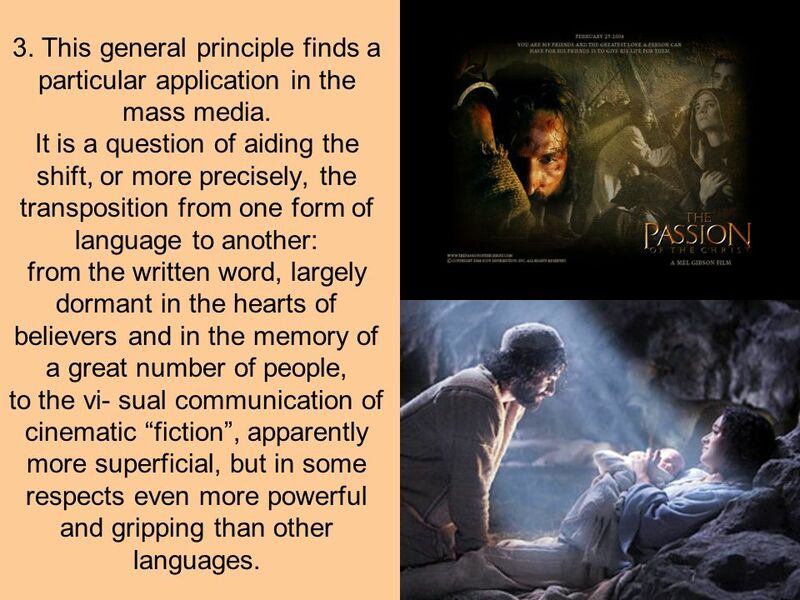 This is what was fittingly recalled in the Pontifical Biblical Commissions Instruction on The Interpretation of the Bible in the Church (Part IV, B, Vatican City 1993, p. 117), which says specifically: The ever increasing importance of the instruments of mass communication (mass media) the press, radio, television requires that proclamation of the Word of God and knowledge of the Bible be propagated by these means. Their very distinctive features and, on the other hand, their capacity to influence a vast public require a particular training in their use. This will help to avoid paltry improvisations, along with striking effects that are actually in poor taste (ibid., Part IV, C, 3, p. 125). 7 3. This providential meeting between the Word of God and human cultures is already contained in the very essence of Revelation and reflects the logic of the Incarnation. 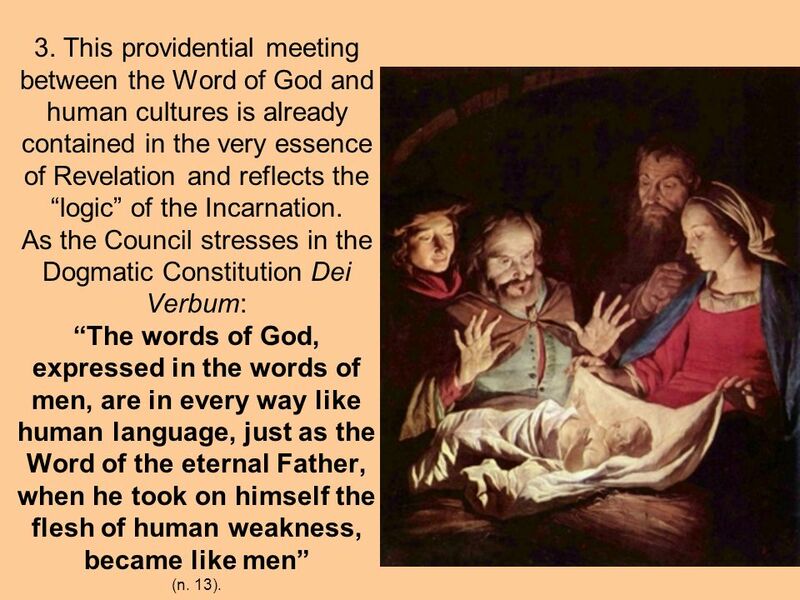 As the Council stresses in the Dogmatic Constitution Dei Verbum: The words of God, expressed in the words of men, are in every way like human language, just as the Word of the eternal Father, when he took on himself the flesh of human weakness, became like men (n. 13). 8 3. This general principle finds a particular application in the mass media. It is a question of aiding the shift, or more precisely, the transposition from one form of language to another: from the written word, largely dormant in the hearts of believers and in the memory of a great number of people, to the vi- sual communication of cinematic fiction, apparently more superficial, but in some respects even more powerful and gripping than other languages. 9 3. In this regard, the efforts repeatedly made down to the present day, which include your own professional work, are worthy of attention because in many cases they have attained a remarkable artistic level. 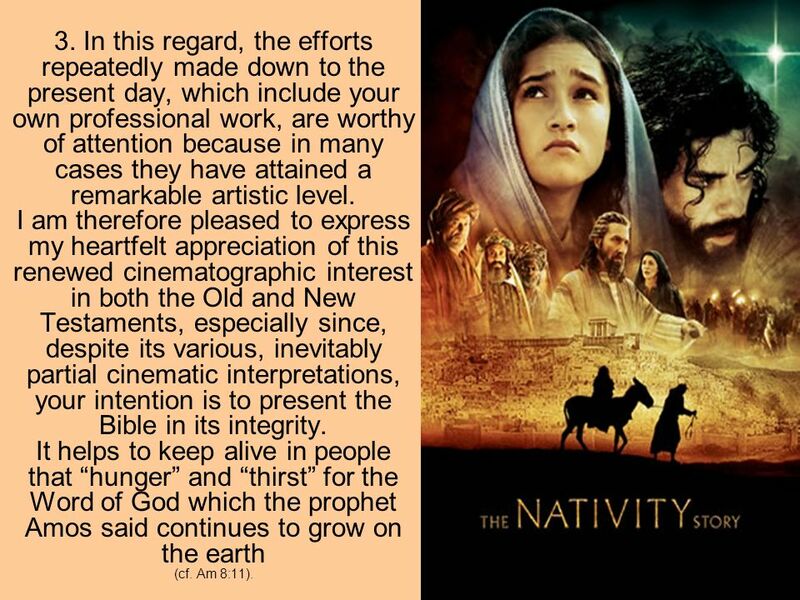 I am therefore pleased to express my heartfelt appreciation of this renewed cinematographic interest in both the Old and New Testaments, especially since, despite its various, inevitably partial cinematic interpretations, your intention is to present the Bible in its integrity. It helps to keep alive in people that hunger and thirst for the Word of God which the prophet Amos said continues to grow on the earth (cf. Am 8:11). 10 3. Mindful of the Apostles words, only that in every way... Christ is proclaimed; and in that I rejoice... and I shall rejoice (Phil 1:18-19), I hope that your service of promoting an ever greater dissemination of the biblical message will continue with renewed commitment, with the intention of producing works which can combine the artistic aspect with profound religious inspiration, and which can arouse in the audience not only aesthetic admiration but also interior participation and spiritual growth. 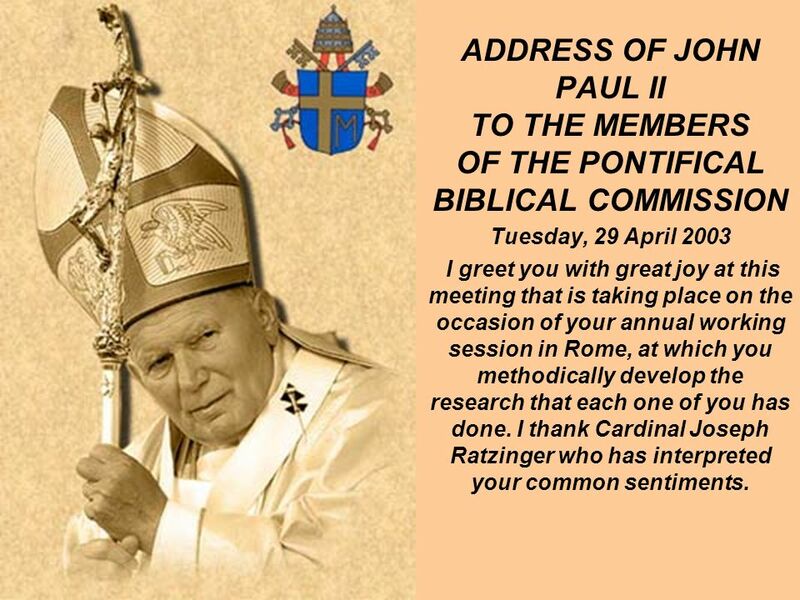 12 ADDRESS OF JOHN PAUL II TO THE MEMBERS OF THE PONTIFICAL BIBLICAL COMMISSION Tuesday, 29 April 2003 I greet you with great joy at this meeting that is taking place on the occasion of your annual working session in Rome, at which you methodically develop the research that each one of you has done. I thank Cardinal Joseph Ratzinger who has interpreted your common sentiments. 13 1. Two things make this meeting particularly special: the centenary of your Commission and the theme on which you have been working in recent years. 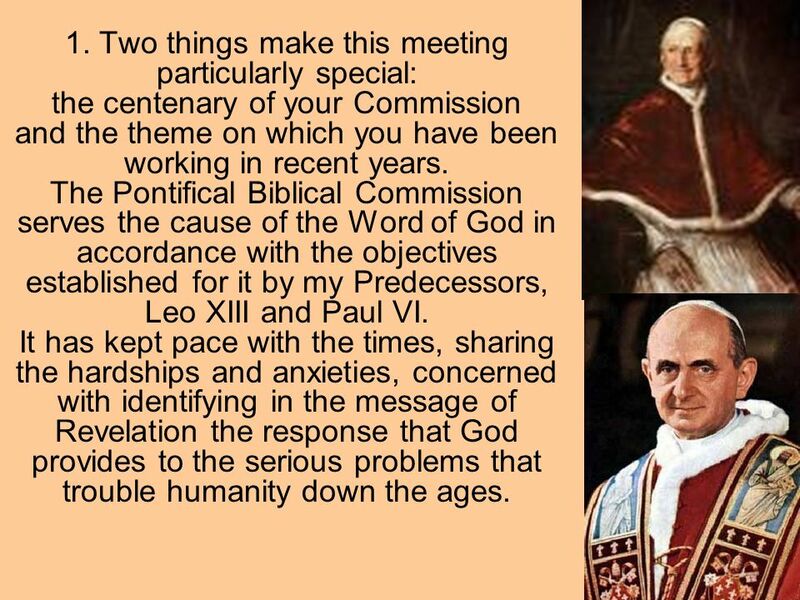 The Pontifical Biblical Commission serves the cause of the Word of God in accordance with the objectives established for it by my Predecessors, Leo XIII and Paul VI. It has kept pace with the times, sharing the hardships and anxieties, concerned with identifying in the message of Revelation the response that God provides to the serious problems that trouble humanity down the ages. 14 2. One of these problems is the subject of your current research. 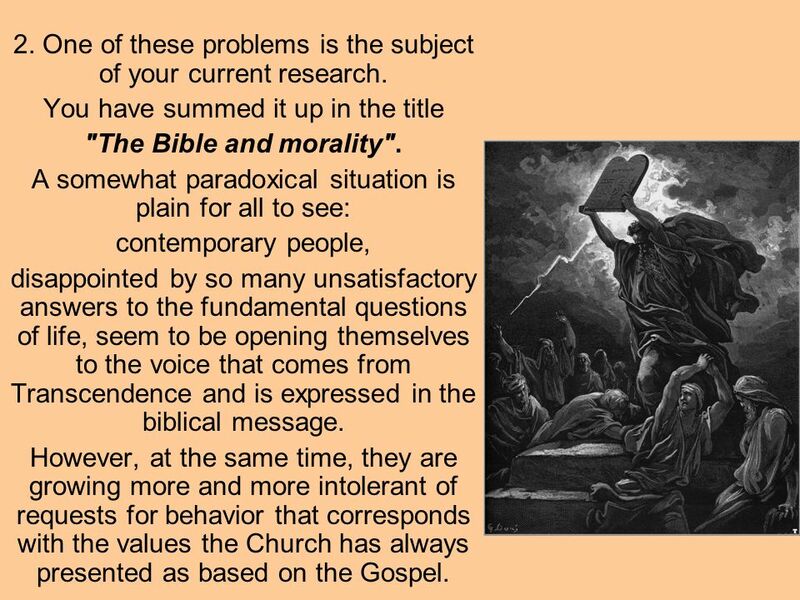 You have summed it up in the title "The Bible and morality". A somewhat paradoxical situation is plain for all to see: contemporary people, disappointed by so many unsatisfactory answers to the fundamental questions of life, seem to be opening themselves to the voice that comes from Transcendence and is expressed in the biblical message. However, at the same time, they are growing more and more intolerant of requests for behavior that corresponds with the values the Church has always presented as based on the Gospel. 15 2. 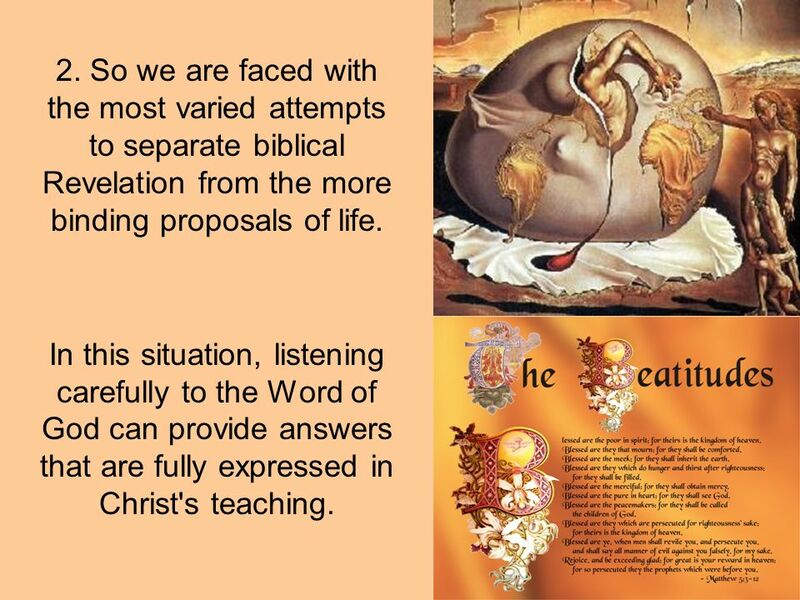 So we are faced with the most varied attempts to separate biblical Revelation from the more binding proposals of life. In this situation, listening carefully to the Word of God can provide answers that are fully expressed in Christ's teaching. 16 2. 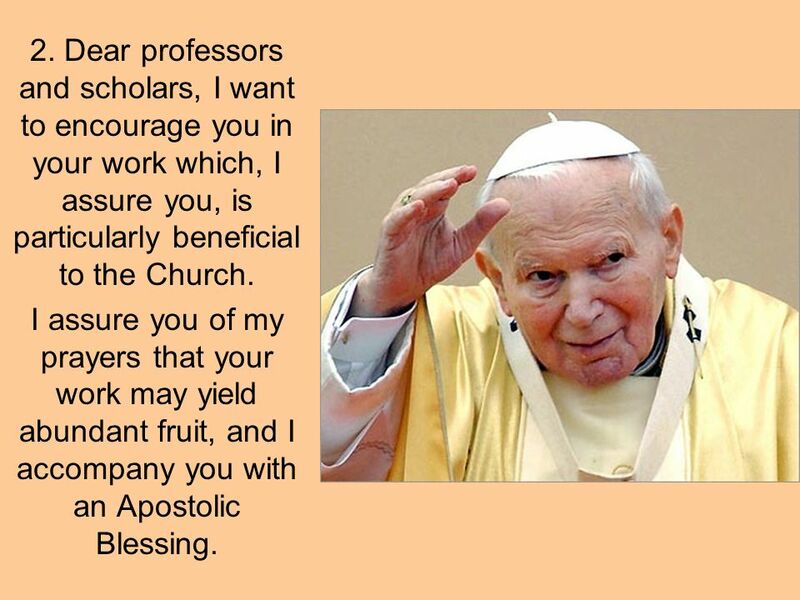 Dear professors and scholars, I want to encourage you in your work which, I assure you, is particularly beneficial to the Church. 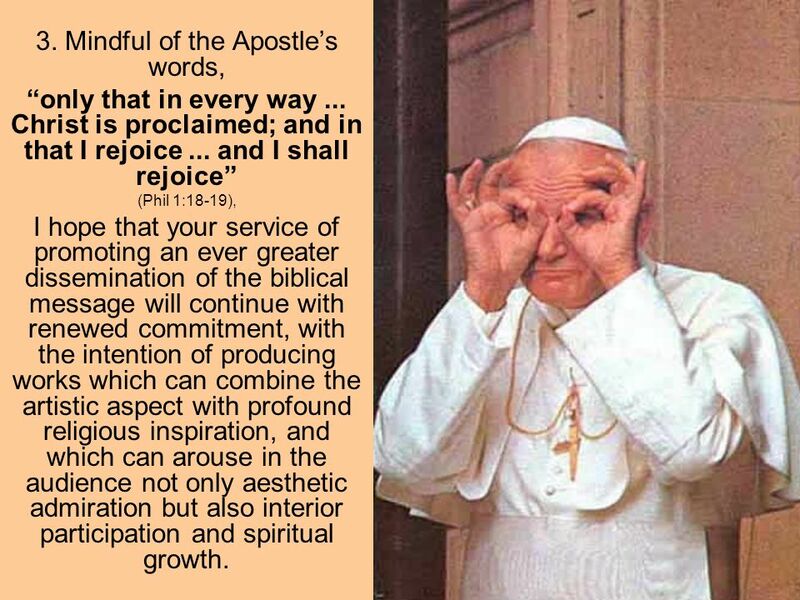 I assure you of my prayers that your work may yield abundant fruit, and I accompany you with an Apostolic Blessing. 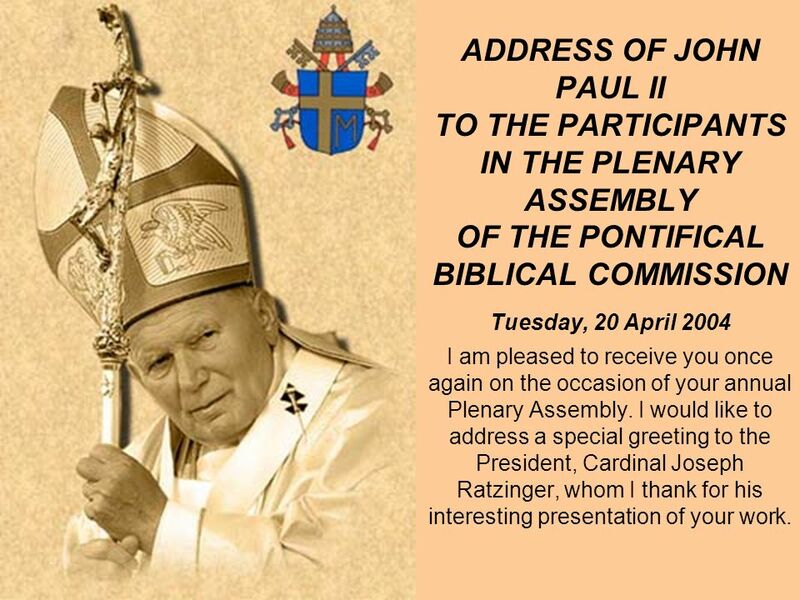 17 ADDRESS OF JOHN PAUL II TO THE PARTICIPANTS IN THE PLENARY ASSEMBLY OF THE PONTIFICAL BIBLICAL COMMISSION Tuesday, 20 April 2004 I am pleased to receive you once again on the occasion of your annual Plenary Assembly. I would like to address a special greeting to the President, Cardinal Joseph Ratzinger, whom I thank for his interesting presentation of your work. 18 2. 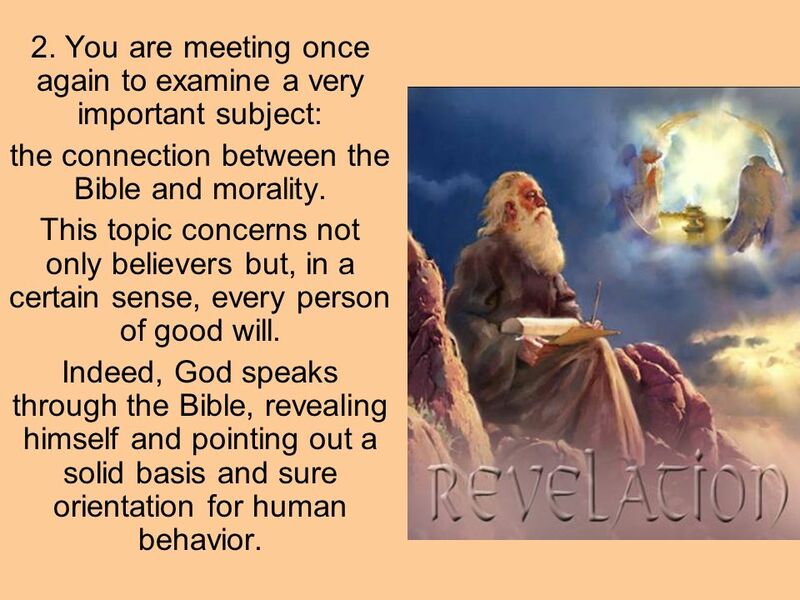 You are meeting once again to examine a very important subject: the connection between the Bible and morality. This topic concerns not only believers but, in a certain sense, every person of good will. Indeed, God speaks through the Bible, revealing himself and pointing out a solid basis and sure orientation for human behavior. 19 2. 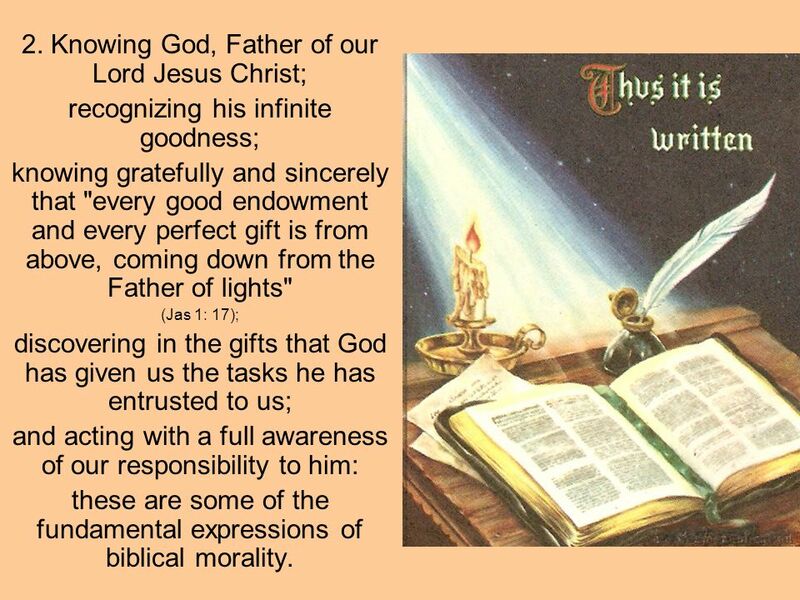 Knowing God, Father of our Lord Jesus Christ; recognizing his infinite goodness; knowing gratefully and sincerely that "every good endowment and every perfect gift is from above, coming down from the Father of lights" (Jas 1: 17); discovering in the gifts that God has given us the tasks he has entrusted to us; and acting with a full awareness of our responsibility to him: these are some of the fundamental expressions of biblical morality. 20 3. The Bible presents to us the inexhaustible treasures of God's revelation and of his love for humanity. 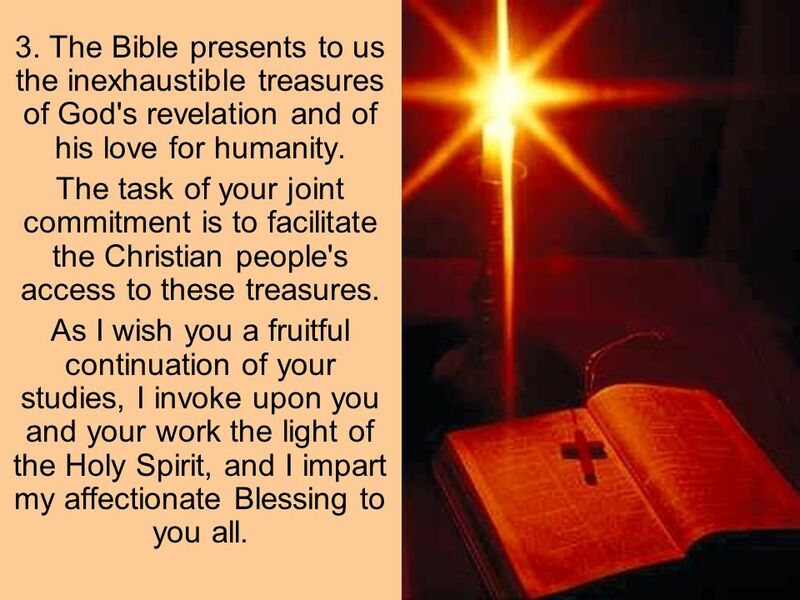 The task of your joint commitment is to facilitate the Christian people's access to these treasures. As I wish you a fruitful continuation of your studies, I invoke upon you and your work the light of the Holy Spirit, and I impart my affectionate Blessing to you all. Download ppt "ADDRESS OF THE HOLY FATHER POPE JOHN PAUL II TO CONFERENCE ON BIBLICAL LANGUAGE AND MEDIA Monday, 28 September 1981. I am pleased to welcome you on the." 1.Gospel is a Redemptive Message 2.The Distinction in Individual & Church 3.History of the Social Gospel Movement 4.What Builds Faith, Edifies, & Causes. "I Believe in the Holy Spirit" General audience of April 26, 1989. 2 Peter 1. 2 Peter 1 The word know or knowledge is used at least thirteen times in this short letter. The word does not mean a mere intellectual understanding. This Is My Bible This Is The Word of God I Love The Word of God I Believe In The Word of God. `. The Fruitful Gospel of Hope Colossians 1:3-8. NATIONAL LEADERSHIP TRAINING PROGRAM Progressive Church of Our Lord Jesus Christ, Inc.
January 14, 2014 Exam 1: Friday 1/17/14  BRING YOUR BIBLES!!!!!!!!! Lectio Divina A Way of Praying the Scriptures. “We wish to see Jesus” Jn 12:21 “The contemplation of Christ’s face cannot fail to be inspired by all that. CHAPTER 2 The Revelation Of Jesus in Scripture. How to Locate and Read Bible References Jn 1: Jn—abbreviated title of the book 2. First number—chapter. Chapter 2: Knowing God Reason and Revelation. 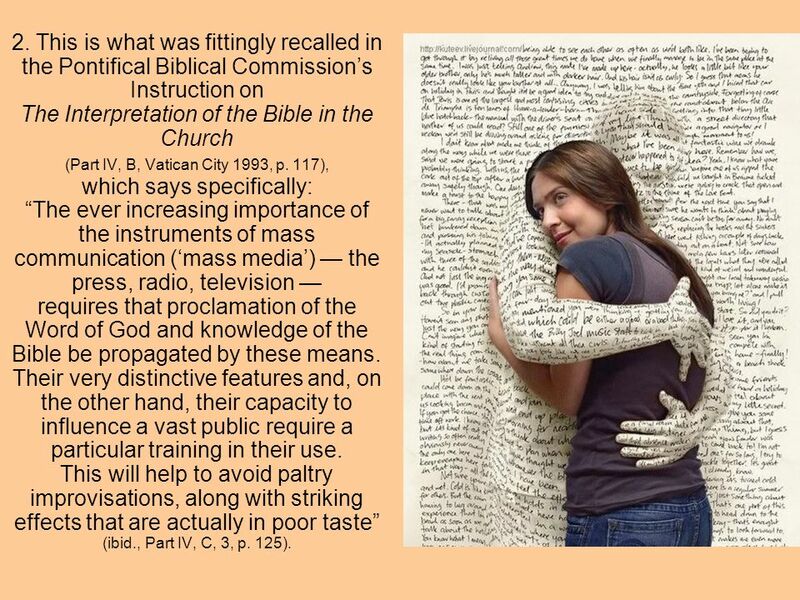 Religion Review (Part deux) Pgs 24-27: Divine Revelation and The Church’s Book. A Meditation on the Spirituality of Work ~ as part of the Ministry of Everyday Life. Colossians 1:24 Now I rejoice in what I am suffering for you, and I fill up in my flesh what is still lacking in regard to Christ’s afflictions, for the. Formation on VERBUM DOMINI School of Apostles Pansol, Manila James McTavish, FMVD Iwao Ikegami, FMVD Sat, Dec 11, 2010. Romans 1:8-17 Ongoing Thrust of the Gospel. Romans 1: First, I thank my God through Jesus Christ for all of you, because your faith is being reported.